I have both Adobe Acrobat and Microsoft Word installed on my Android device. Although Acrobat is set as default PDF viewer in the system settings, Evernote always opens PDF files with Word. In order to open them with Acrobat, I have to use the context menu of the file and press "View". Can I somehow change this behaviour? Thanks for your help! I think this is set in Android / Application Settings / Word - Evernote reliably uses the 'right' application for me no matter what attachment I have. My PDF files open in Xodo Docs. Thanks for your reply! Word isn't set as standard for anything, still opens PDFs in Word. Can you post a screenshot of the settings you mentioned? Thanks! Hi, any update on this? My pdf document defaults to opening in Word instead of Google drive or Adobe acrobat. However, if I long press the pdf document and select View, it opens in Google drive. How do I set that as default? I'm having a similar problem. Not only isn't Acrobat offered as a possible viewer, but PDFs used to show directly in the note. Now they don't. 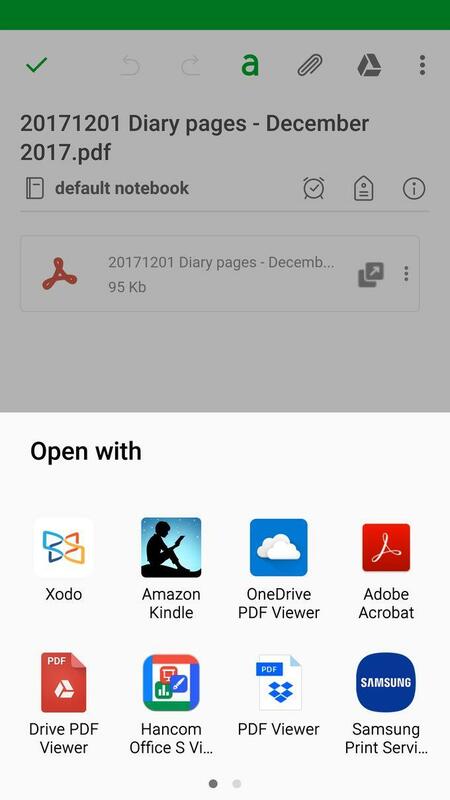 Yes me too it's very annoying that pdf's open in Word & to open in my app of choice I have to hold down on the pdf and select view. Edit: Actually I need to tap the file to see the menu and choose View from the menu. No ling presses required. AFAIK though PDFs have never shown inline in a note. 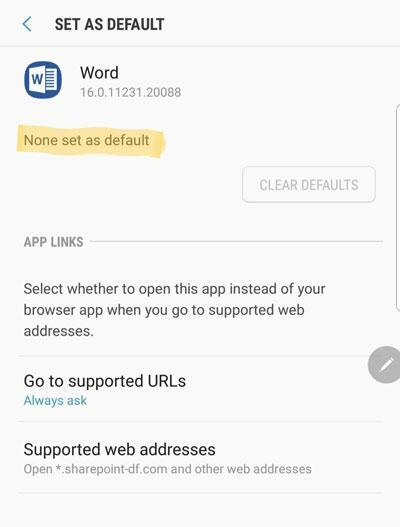 I do not get the option you get, when I tap on a pdf evernote immediately opens the pdf in Word, even though I have cleared defaults for Word in my phones settings. The more I use evernote for Android the more I realise how many bugs it has, I'm really not liking it. Evernote tries to open PDFs in an app registered as PDF editor first, and viewer second. Word registers itself as editor. I have other pdf editors installed, but Evernote doesn't give me the option of what pdf editor I want to use.